Holmestead Farm is the end result of a 30-year long dream I’ve had since I bought this land in 1988. I’m now doing what I truly enjoy doing … and with a partner who loves it as much as I do. 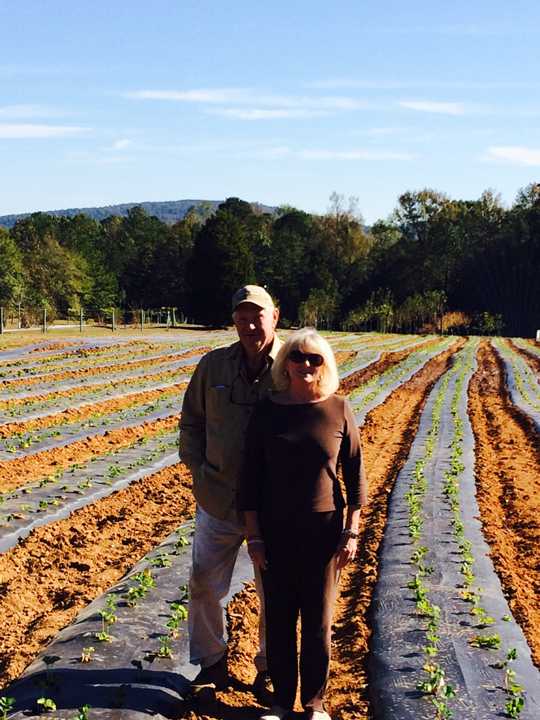 My name is Bobby Ray Holmes and with my partner Mary Kimerling, we opened Holmestead Farm in 2010 to the public. It took us years to get the land and property ready for farming and more years to get the vineyards and fruit trees ready. The hard work has been well worth it and we think you’ll agree when you taste the best blueberries, blackberries, raspberries, muscadines, and scuppernongs in this part of Alabama … all pesticide-free and grown with organic fertilizer. And don’t forget we have fresh okra, tomatoes, squash, purple hull peas and peppers, too. We encourage you to pre-order your vegetables as we sell very quickly everything we grow. Make sure you get the Holmestead vegetables you want – call to order your fresh vegetables during season. So be sure to click the link below and sign up for our Holmestead Farm News and we’ll let you know as produce comes in from season to season. Be the first to know … sign up for Holmestead Farm News via email – Click the envelope image to get started. Forms of payment: We accept cash, local checks, MC, VISA, Discover, SNAP (Food Stamps) Farmers Market Nutrition Program (FMNP) checks and Senior SFMNP checks. When you plan your trip to Holmestead Farm, leave yourself some extra time to walk our nature trails, play some horseshoes, have a picnic in our big picnic area, or just sit a spell and enjoy some of the most beautiful scenery in Alabama at the foothills of the Talladega National Forest and Mt. Cheaha, the tallest point in the state. So plan a trip to Holmestead Farm and stock up on some scrumptious berries, fruits or vegetables. Make a day or weekend of it. There’s lots to do in this part of Alabama and we think when you visit once, you’ll end up coming back again and again. We look forward to seeing you soon and don’t forget to sign up for our email news updates. Contact Holmestead Farm at 256-404-4316 or via email at holmesteadfarm@yahoo.com.